Text: It is months since I have written a line and even reading tires me. The interest I took in socialism and the rest has left me. I have gradually slid down until I have ceased to take any interest in any subject. I look at God and his theatre through the eyes of my fellow-clerks so that nothing surprises, moves or excites me or disgusts me. Nothing of my former mind seems to have remained except a heightened emotiveness which satisfies itself in the sixty-miles-an-hour pathos of some cinematograph or before some crude Italian gazette-picture. Comments: James Joyce (1882-1941) was an Irish novelist and briefly (December 1909-January 1910) a cinema manager. In March 1907, years before his first book was published, he was working in a bank in Rome, a low period of his life. 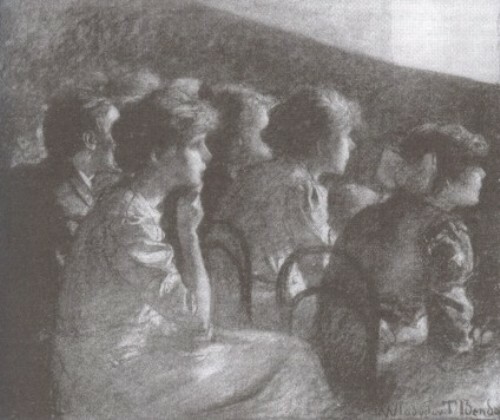 Joyce was an occasional cinemagoer from the 1900s through to the 1920s, even when his eyesight became very poor. This entry was posted in 1900s, Italy, Letters and tagged James Joyce, Newsreels, Rome, Speed. Bookmark the permalink.